Downward dog, half moon, warrior 1 or 2 or 3 (or 4 is on the floor), clavicle, ischial tuberosity, piriformis, “23 yogis”, garudasana, ustrasana, vrksasana, mulabanda, vyana vayu, Ganesh, the Trimurti, and more. That’s been my life for the last month as we are deep in the heart of Yoga Teacher Training. And when not perfecting my extended side plank or standing bow, I have been swimming in IEPs, ESERs, alternative school lottery, our All-School Seminar, standardized testing, and most importantly, loving my students. No, I have not completely forgotten about the blog, but it has certainly been neglected. Well, I’m back. 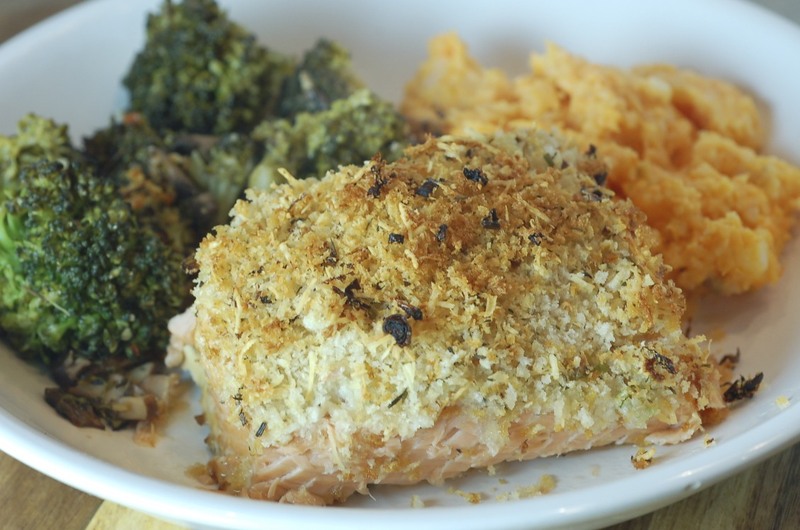 And back with a GREAT meal–parmesan panko crusted king salmon with a hint of lemon and green onion. Holy smokes. The Beau went to Homer to fish and brought back a few fresh filets of king salmon. Clearly we had to give it star treatment. This was–without a shadow of a doubt–the best salmon dinner I have ever had. Ever. 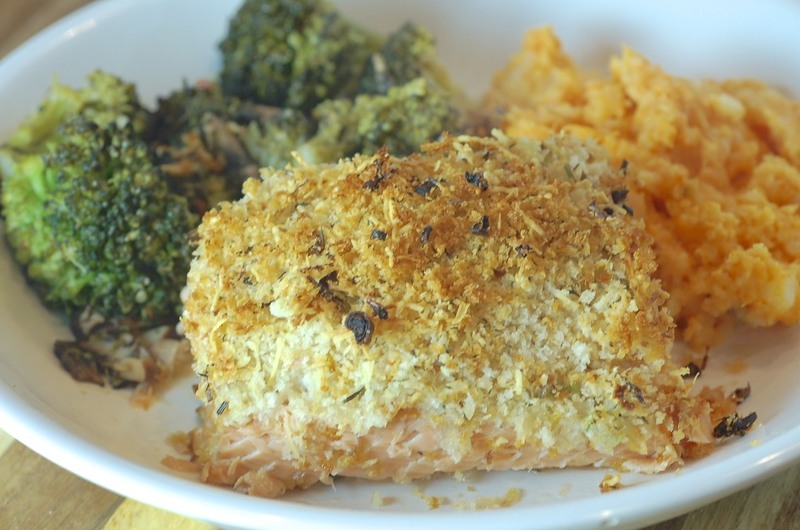 The crust was light and crispy, while perfectly highlighting the rich, dense, flaky, and fresh flavor of the salmon. What’s even better, you ask? The fact that it took approximately 32 seconds to put together and put in the oven. That’s when you know you have great fish; it’s perfect in simplicity. If you want to treat yourself and your loved ones to an incredible meal (without having to do any work), then this is certainly the dish for you. I imagine that the crust would be great on halibut or other fish as well as chicken. It’s perfect. Great to see you guys! I am happy to be back! Preheat the oven to 375 degrees. Line a baking sheet with tinfoil. Place salmon on sheet, skin side down. It is important to keep the skin on the salmon because the skin will adhere to the tinfoil–this seals in all of the flavor and ensures that the meat doesn’t get stuck too. 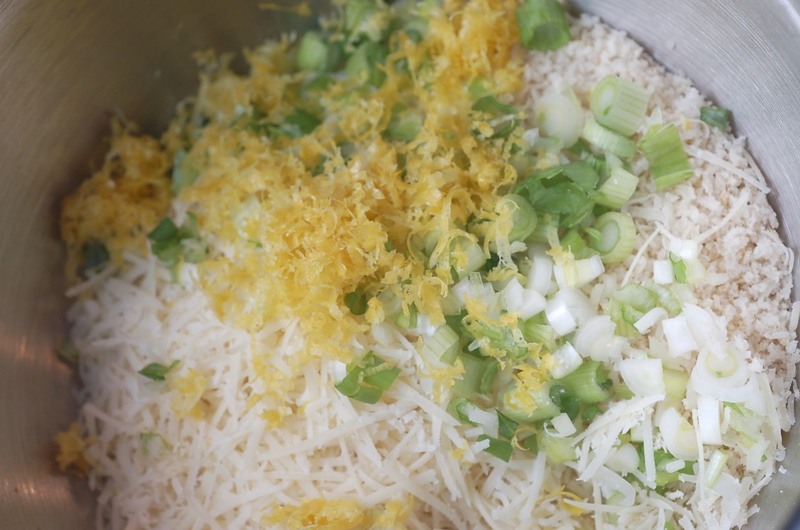 Add the Panko, cheese, salt, green onion, the lemon zest, and the thyme to a small bowl. Mix well. Drizzle a little olive oil on the salmon. Use your fingers to spread it evenly. 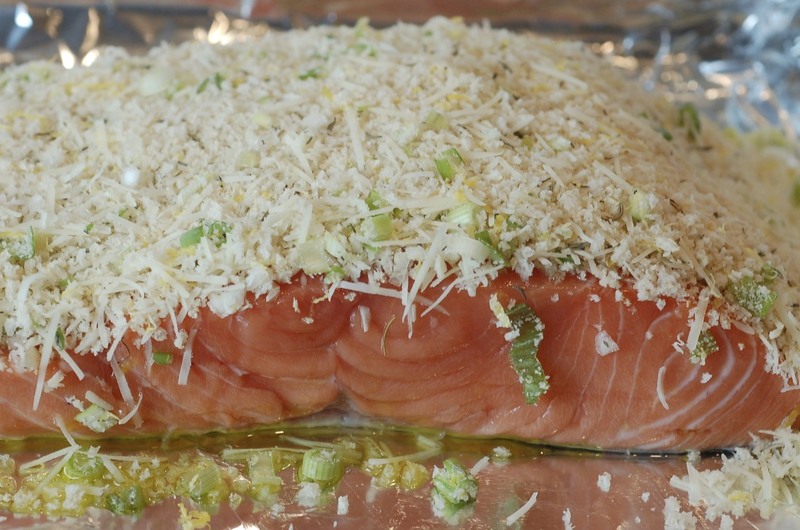 Press the crust mixture on the salmon evenly. 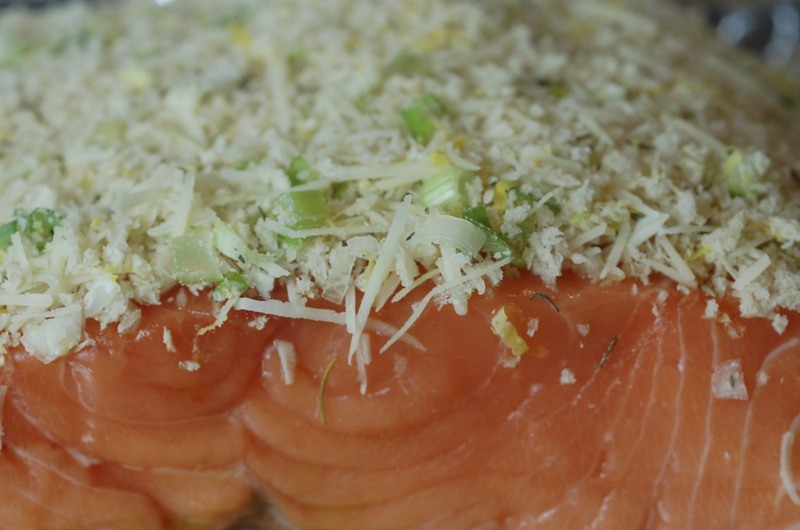 I used as much of the crust as possible–I couldn’t see the salmon through the crust. I'm sold on this one, even if we have to settle for frozen Atlantic wild-caught. Welcome back!